An air conditioning system is one of the popular acquisitions in many homes to hold off hot summers and cold winters. Available in many different sizes and shapes, it can be installed in apartments, small studios, mansions, and large multi-room homes. But question is, how do you find the right AC? Well, you don’t need to. We did the hard work for you guys and picked out the best Air Conditioners in India (both split and window) so you can enjoy the feel of the cool winter breeze even at 47-degrees (Delhiites, here’s a shoutout to you). LG Q18HUZD: With a 5-star energy rating, top of the of the features like a stabilizer free operation, auto cleaning, monsoon comfort, and a 1.5-ton capacity, the LG Q18HUZD can cool room up to 180 sq. ft. in a matter of minutes without needing much maintenance or inflating electricity bills. 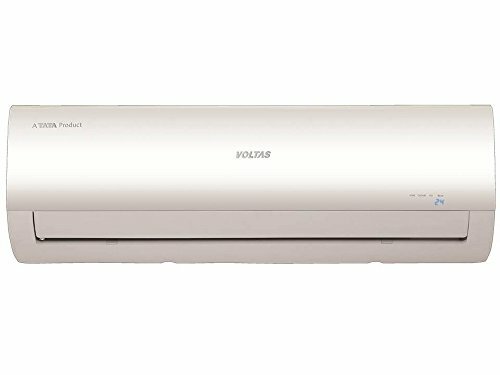 Voltas CZT: But if you don’t want to pay the big bucks, you can still get a 1.5-ton AC at less than Rs. 35,000. Though not as energy efficient as the LG Q18HUZD, it comes with all the important features to keep you cool even in burning hot temperatures. Voltas DZA: Are you looking for a window AC? This Voltas AC too comes with a 1.5-ton capacity ideal for cooling the largest of rooms and has a 5-star energy rating as well which means it is one of the most energy efficient window AC’s you will come across in the Indian market. If you have the big bucks and will only settle for the absolute best in the market, this AC is pretty much everything you could have asked for and here’s why. In peak summers the AC is most likely to run all day long which means exorbitant electricity bills, right? But not so with the LG Q18HUZD. How do we know that? Since it comes with a 5-star BEE (Bureau of Energy Efficiency) Rating. This means that it consumes a mere 800-900 units of power per 1600 hours of running. And the energy efficiency comes down to dual inverter compressors. This means the AC can vary its speed and tonnage based on the temperature inside the room, in turn, drawing less power (yup, inverter AC’s are super smart). The AC comes with copper condenser coils which are not only more durable than aluminum coils but also more energy efficient. Not to forget, they are better and quicker at cooling and require minimum maintenance (Effective, Efficient and Durable, that’s a trio hard to beat). Add to that the gold coating on the coils which ensures they do not rust for years to come adding to the overall durability of the AC. Plus, compared to the Blue Fin Technology, it fastens defrosting which, in turn, improves heating efficiency. The AC has a 1.5 tonnage which means it can easily cool a room of about 180 sq.ft. within 25-30 minutes especially with dual compressors at the helm. Apart from that there plenty of modes to choose from based on the surrounding temperatures like the energy saver, monsoon comfort etc. Wouldn’t it be cool if you could troubleshoot even AC with your mobile as well? The smart diagnoses system lets you do exactly that so your AC always functions at optimum levels (time to live the life the smart way). The 3M filter keeps the air free from a variety of allergens and air pollutants so you can breathe fresh air. With the Auto Clean Mode, cleaning the heat exchanger is just the press of a button away as it eliminates bacteria, humidity and mold quite efficiently. Lastly, it needs no stabilizer which saves you additional cost that comes with the cheaper AC’s. Not to mention any trouble with the stabilizer means you lose your AC until repairs are made (hassle-free cooling, just the way an AC should be). The AC uses R-410 coolant which although does not deplete the ozone layer but can add to the growing global warming and thus, isn’t the eco-friendliest of coolants. Also, the AC will cost you in excess of Rs. 40,000. Though that is a cost worthy of the features. The 1.5 tonnage means it is ideal for rooms of about 180 sq. ft. There are plenty of modes to choose from like the Monsoon Mode, Energy Saver etc. If you need a slightly cheaper split AC, this Amazon best-seller is where your search ends at. It too comes with an inverter compressor which means it auto adjusts the speed and tonnage once it reaches the desired temperature so as to reduce energy consumption. Furthermore, 100% copper coils of the compressor too play an important role in lower energy use but more importantly outperform their aluminum counterparts on the effectiveness and durability front. Also, maintaining them is pretty easy peasy since these need not be enclosed in heavy-duty cabinets like the aluminum coils. And so moisture and humidity in states like Delhi, Rajasthan etc. does not corrode the compressor, it has been coated with the Blue Fin Technology. But why does all this matter so much? That is because the Compressor is the heart the AC. Without it, its just a skeleton and replacing it or even repairs do not come cheap. Just like with the other 1.5-ton AC’s even the Voltas CZT is perfect for rooms of about 180 sq. ft. Find the right settings and there is no doubt over a sound cool sleep all night long. The AC has a 2 stage filtration process to weed out the dust, pollen, and allergens from the air so you always have fresh air to breathe. Furthermore, modes like Instant Cooling or High Ambient Cooling can cool a room at even 52-degrees in a matter few minutes (can’t wait for the room to cool down? Now, you won’t have to either). There is also a humidifier mode perfect for monsoons, sleep mode for a cozy nights sleep and a timer that is perfect for the forgetful you. Any problem with the AC is easy to detect with the self-diagnosis system which automatically displays an error message anytime there is a malfunctioning. But that not the only smart feature of the AC. In case of a power cut, the AC will automatically restart from the previously saved settings. Lastly, due to the wider voltage range, the AC can easily handle every day fluctuation changes without a hitch and thus does not even require a stabilizer. This AC also uses R-410 coolant. While it is a good choice as it does not deplete the ozone layer, it increases global warming which makes a less eco-friendly choice as compared to propane etc. It comes with the Blue Fin Coating rather than the more efficient and effective Gold coating like the LG. Though no doubt, it too performs really well. It only has a 3-star rating and isn’t as energy efficient as a 5-star AC. 1.5 tonnage means it can be used in rooms up to 180 sq. ft. If you are looking for something more energy efficient and feature-rich as compared to the Voltas CZT, the Voltas SZS is the ideal pick. While it is similar in most front, there are a couple of notable differences. Firstly, it is a 4-star AC and thus is bound to be more energy efficient than the CZT. Secondly, apart from a 4-stage filtration, it also features a Silver-ion filter which releases ions into the air to kill microbes like bacteria, fungi, virus etc. making the air even fresher to breathe. Lastly, it also has anti-fungal properties to prevent fungus growth on the inside and also has Cross Flow for better all-around cooling. Have a smaller room? Then a 1-ton AC should be ample to keep it cool all day long and we know just the model you should get. Since the AC has a 5-star rating by BEE and it being a 1-ton AC, you know it is going to be super efficient when it comes to power consumption (consumes less than 550 units for 1600 hours of usage). And like all inverter air conditioner, even this one will auto-adjust the speed of the AC once the set temperature is achieved so the power consumption is at minimal. Unlike non-inverter AC’s where power is consumed at full wattage every time the temperature increases by even 2-3-degrees. By now we are pretty sure you know, a copper compressor is way more durable, efficient and effective when it comes to cooling and luckily, Godrej gives you just that with even their 1-ton AC. Plus, the with the Bluefin coating on these coils, they can withstand all the moisture and humidity that may at it especially if you live in regions like Delhi, Punjab etc. This rust-free coating means a zero-maintenance headache which makes this AC the perfect combination of durability and a maintenance-free AC (because nobody likes constant repair and checks). Since this is a 1-ton AC it can only efficiently cool a room of less than 125 sq. ft. Anything more than that, and you will require a 1.5-ton AC to ensure proper cooling in every part of the room. To give you fresh breathing air the AC has been equipped with 2-stage filtration process to keeps away dust, allergens and pollens. Lastly, it also has various modes which allow it to give the perfect cooling in the highest of temperatures, humidity etc. You can also set a timer or use the energy saver mode if needed. A noisy AC can be annoying and disturbing hence the Godrej has ensured the AC is as noiseless as it can get (operates at just 28 decibels). Also, minor fluctuations have no impact on the AC. And even in case of a power cut off, it will restart automatically using the previous settings. On the downsides, the AC is only ideal for smaller rooms and won’t cool the entire room if placed in rooms bigger than 125 sq. ft.
Also, it too uses R-410 coolant which as you know can increase surrounding temperature, in turn, adding to global warming. But on the bright side, it has no impact on the ozone layer. Works perfectly well in a room of up to 125 sq. ft.
And the Silver-ionizer rids the air of bacteria, virus etc. Who Should Use an Air Conditioner? The air conditioner is designed for everyone and for every home and building. You might want to improve the value of your home or office with a top-of-the-line AC solution or want to look for a simple device for a couple of room in your apartment. If you live where it is dry and cool, you may want the heat to control your home. Otherwise, you want cooling if you are in a humid, hot climate. With an air conditioning unit, you can be able to maintain perfect humidity in all parts of your property. You can supply a sufficient and consistent supply of ventilation. Here are some of the perks of installing an air conditioning unit. The climate’s coldness or hotness may limit or deter your daily activities and even work productivity. With an AC, you can feel fresh all day long and customize your environment according to your tastes. With an air conditioner, insecticides, fumes, and other toxins are eliminated. These greatly contribute to your health and the quality of air. Heat, most especially the humidity that frequently comes with it, can wreak havoc on all kinds of furniture. Wood, leather, and fabric are all susceptible to moisture and mold. Since your doors and windows are closed when the unit is working, extra security is offered. This will prevent pesky insects and unwanted people from intruding your property. Insects are annoying and dangerous to those with allergies. The filters in an AC unit keep out insects and even indoor pets tick and flea. Off-season discounts are along the way. Take this opportunity to buy a good AC. However, make sure to keep these seven important things in mind while purchasing your next unit. You would want an air conditioning system that will serve you for years, right? Therefore, it makes sense to invest in a reputable company with outstanding after sales service and broad experience in the industry. If you’re looking for a unit with dual purposes (heating and cooling your home), a reverse cycle might be a good pick. You don’t want to purchase a unit that’s too big in size for your home. So, ensure to take into account the cooling capacity as well as the size of the air conditioner and your house. With the increasing energy costs, it is crucial to buy an air conditioning system which can deliver you the best cooling and heating while consuming only the least power. It should have a higher BEE star rating. A unit with various pre-defined settings provides better cooling and heating while saving more energy. Make certain to get your unit installed from an authorized manufacturer. Ask how often should the system be cleaned and what are the proper ways to maintain it to ensure maximum performance. Do not pinch your account too hard. After all, there are heavy-duty air conditioner units available at affordable prices. Thorough research is what you essentially need. A number of air conditioners are available in the market; each caters to space requirements and a certain budget. Below are the common types of air conditioning units you will find. Typically considered to be the most effective type of air conditioner. It has two units, one of which is installed inside the home and the other outside. Split systems tend to be more efficient, more powerful, and quieter. Though a little expensive to install, it efficiently works more in cooling a home or office. Large establishments including big offices and hospitals make use of ducted systems. This is a very versatile unit that can be easily moved from one room to another, thanks to its wheels and compact design. Ideal for garages, bedrooms, and dorm rooms. Produces both cold and hot air to keep homes and offices comfortable all year round. While a bit costlier than pure cooling units, the reverse system is a good investment especially for people who reside in erratic climates. Commonly installed in an external wall or window. Another more cost-efficient alternative to split systems, wall/window can be able to provide you with exceptional results. If you want to cool a room without sacrificing your window, then thru-the-wall models can be your best option. These self-contained, single units are installed in the wall. It is a commercial grade, self-contained, a single unit that is installed through a wall. Packaged terminal air conditioners are what you can usually found in hotels. The system’s configuration and unique size add to its appeal. This is another option for those who want to cool their home. Evaporative systems are usually used in places where low humidity and high temperatures exist. Ready to beat the heat? Make sure to rely on this guide for a better shopping experience!